08-May-2005 -- The confluence: on the Northern slope of a small hill in the midst of barren rolling hills in the heart of a mining area west of the town of Sierra Gorda. This area is flanked by two copper mines: Mina El Tesoro and the much smaller Caracoles mine; and is pitted with much smaller mine claims and is a network of trails and cairns marking the claim sites. 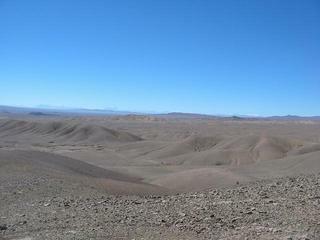 The area is almost totally devoid of plant life and animal life. Having been greatly disheartened by y misadventures trying to get to 23S68W and unwilling for two reasons to give it another attempt: one for fear of a repeat failure and two because I was physically exhausted from the previous day, I decided to go have a look at this confluence instead. I had made contact with Mina El Tesoro and had been assured that the point was not on their territory and more usefully that I could take the old road up towards the Caracoles mine which should bring me close. Leaving Calama at a reasonable hour I headed down towards Sierra Gorda, a one horse town that seems to exist solely from the mines in the region. I scouted around in my 4x4 rental trying to find the road up to Caracoles. After a following a few possible roads I found the dirt road I needed to be on. Numerous dirt tracks branched off the main one but with the GPS and a good reading of the landscape I arrived to within 1.2 kms of the confluence point. I left the car and started walking over easy rolling ground. A short climb up a saw me at the confluence. Obviously not the first person there the point was marked by a small cairn and there were jeep tracks little more than 4 metres from the confluence. Many thanks to Jorge Gutiérrez for his brief but invaluable help.